A few months back, I posted about No Poo (click here for that post) and mentioned I was very interested in trying it. Well, pretty much ever since that day, I haven't used shampoo! I use baking soda and water to wash my hair every day and I love it. To condition it, I use organic apple cider vinegar diluted in water and my hair looks rich and healthy and my hair color has never looked better! I've had my moments with it and had quite a few bad hair days trying to find the right balance for my hair, but I really wanted to stick with it because I love the concept of not using weird ingredients on my skin. Plus, bad hair days aren't the end of the world, I just put my hair up, but now I can wear it down and it's not too oily or too dry; in the words of Goldilocks, it's just right ;). Our skin is our body's biggest organ and soaks up things we put on it, so I've been learning more over the past year about what is good for skin and what is not so good for it. Shampoo has chemicals (sulfates being one) that strip hair and the scalp of our natural oils, drying it out. It also, in most cases it has parabens, a preservative that is used in most beauty products. Grab one of your beauty products (lotion, deodorant, makeup, shampoo and so on) and see if you can identify a paraben (may be have methyl, ethyl, propyl or butyl along with paraben in the chemical name). I may write more about parabens later - we've been ridding our home of them over the recent months (Google search "paraben dangers" or something similar for more info about them). With the no poo, there are no weird chemicals to worry about and my hair looks better too. The biggest difference I notice is my hair color, and it even looks less damaged. I had comments over Christmas asking if I had dyed my hair darker! I have not dyed it at all since we've been married, but I think my natural hair color, not influenced by chemicals, is now shining through and I love it. 1. Keep baking soda in a small tupperware in the shower. After hair is wet, scoop out about 1 and 1/2 tbsp into your hand, make a paste by adding some water in the palm of your hand and massage through hair and scalp, especially in oilier areas, for 30-45 seconds. Depending on hair length and type, you may need more or less (I had to troubleshoot the amount I use for awhile to get it right). I allow it to stay on my hair for a few minutes while I wash my face, then I rinse it out. It should feel clean and usually is squeaky clean for me. 2. 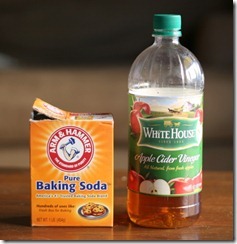 Keep a squeeze bottle of apple cider vinegar in the shower along with a cheap plastic cup. I squeeze about 1 tsp - 1 tbsp or so and add about 1 cup, maybe a bit more, of water (I use a line on the cup I have to measure :)), tilt my head back and pour over my hair (use caution to not get in your eyes - that would burn!). I leave that in for a few minutes while I wash/shave, etc. and rinse it out. I've adjusted it many times, adding more or less of each and for a while, trying without the vinegar during the beginning oilier days, but then it makes the hair course and hard to manage. When I don't use enough baking soda, my hair may be static-y and oilier. If you try this method, you want to give yourself patience and troubleshoot/experiment until you find a balance that works for your hair and skin (this website is amazingly helpful for tips to adjust no poo problems (oily/dry/frizzy...). I'm so thankful I gave it a try! We'll save a LOT of money not buying shampoo and conditioner and keep our skin healthier in the process - a win win for me :) Baking soda and apple cider vinegar are cheap and last a long time. If you try it, you should let me know, I'd love to see how it works (or doesn't work) for you. Be brave and give it a shot, you may love it!